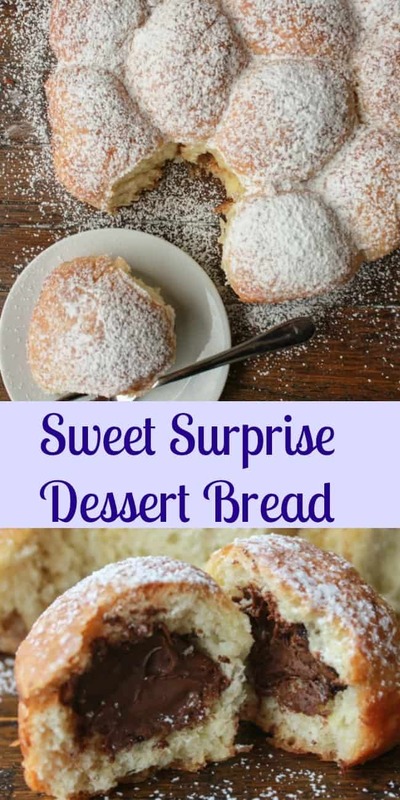 There is nothing better than a Sweet Surprise Dessert Bread! 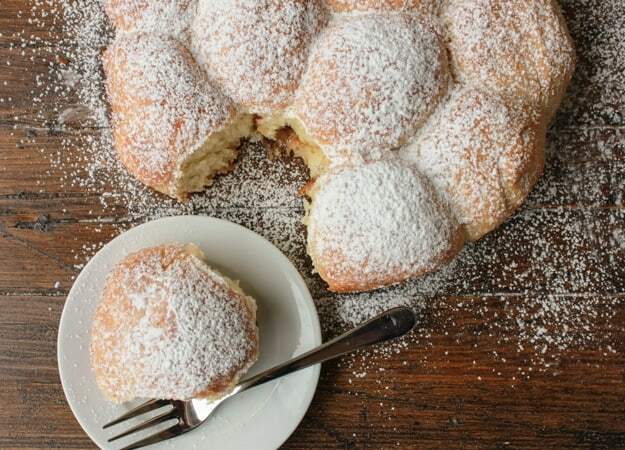 Filled with your choice of filling, made in the shape of a delicious pull apart bread and that you can also eat at Breakfast! I love making yeast breads, I love the smell while they are baking in the oven, I love the kneading and the rising and best of all I love them warm out of the oven. But to tell the truth I rarely make sweet bread. I quite often make homemade Pizza and Savory Breads. 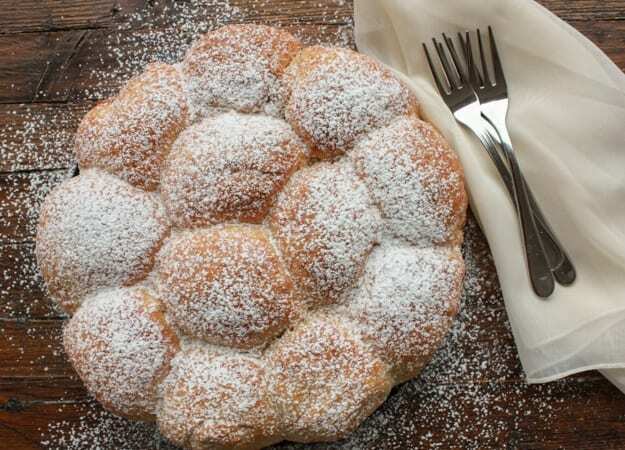 But sweet breads such as this Pull Apart Bread have always kind of intimidated me, until now! I don’t know why, but I always had it in my head the sweet yeast bread would taste, well yeasty. But not so, this Sweet Surprise Dessert Bread came out soft and delicious, and not overly sweet. 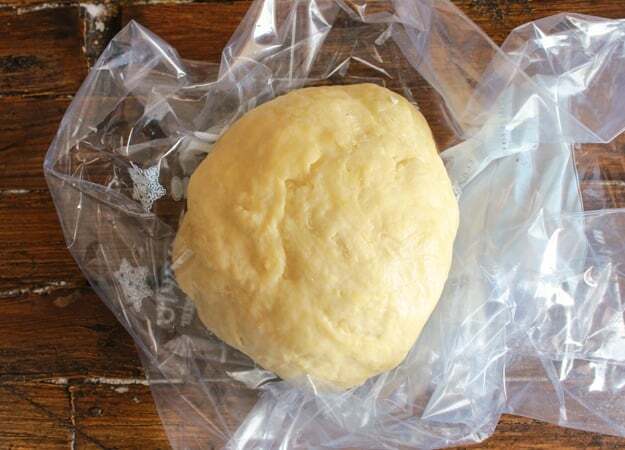 I know a lot of people get put off making yeast bread because they think it is too much work or it takes too much time. Maybe a little time but not much work and totally worth it. If you prefer to use your stand up mixer with the hook attachment then that is fine too. Just remove it from the bowl when almost combined and knead it for approximately 10 minutes. 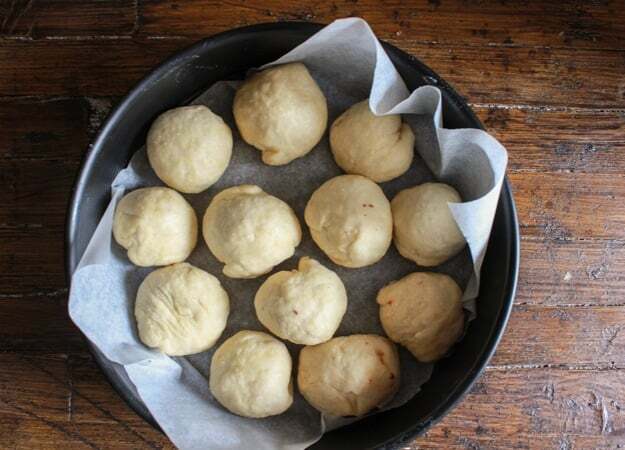 When flattening the balls for filling, flatten with the palm of your hand and gently stretch with your fingers, don’t use a rolling-pin because it is too hard on the dough. My husband’s Pastry friend told me that one. 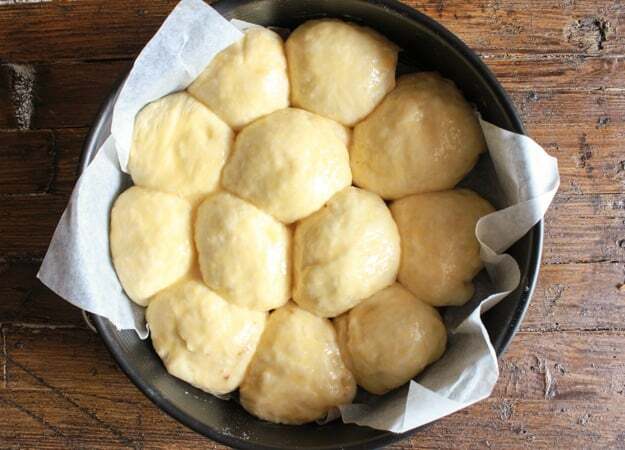 Remember if you flatten them as much as possible when adding more filling, just make sure you seal the ends really well so the filling doesn’t come out while baking. 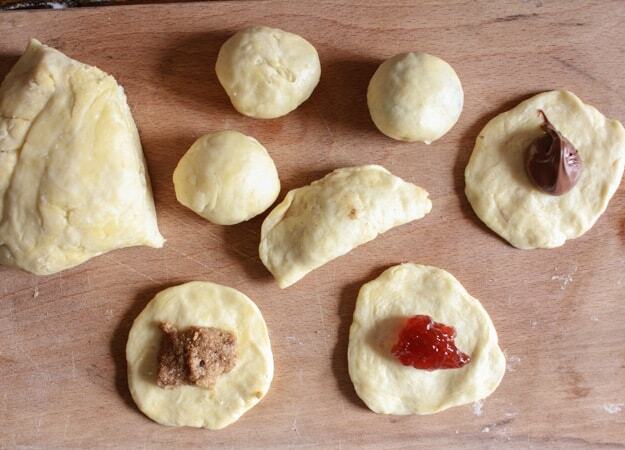 Roll back up into balls, place in cake pan seam side down. Let rise for a couple of hours, brush with a beaten egg and melted butter combination. 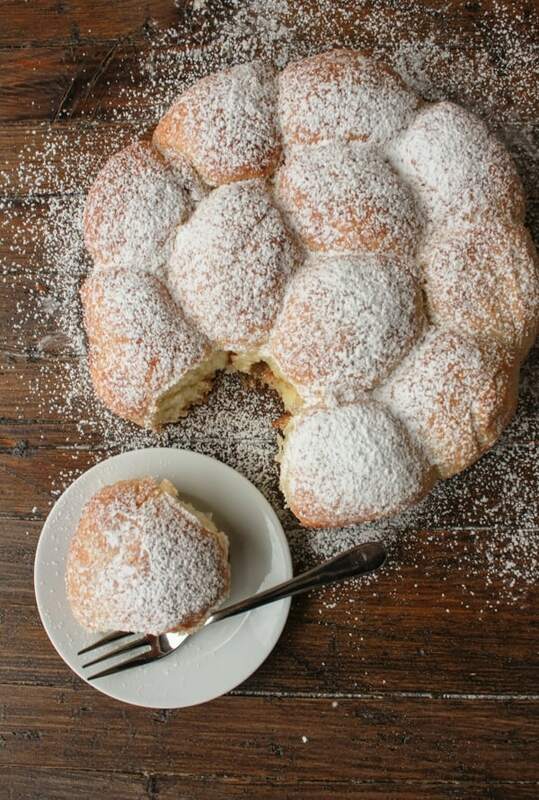 And there you have a Sweet Surprise Dessert Bread. Now just bake it and eat it while it is still warm, I dare you not too! Enjoy! **Inspired by Il giornale “Alice” October 2015. Updated from October 12, 2015. Hi Rosemary I made these today and my taste taster husband loved them and so do I. I dropped some off at my daughters’ homes and they were absolutely in love with them. 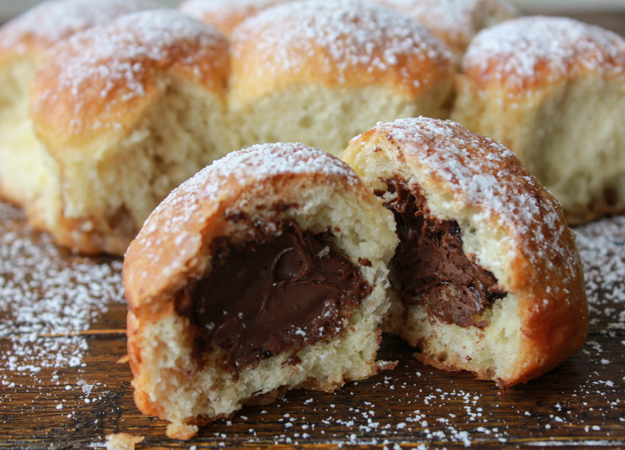 But then they and my grandsons and son in laws love anything Nutella. Like you, I love baking but baking with yeast is my favourite. The smell in the house is intoxicating especially now that it is winter. I have baked so many of your recipes during my holidays and unfortunately next week I will be returning to work so the baking will be a little less. 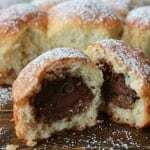 Thanks for sharing and as I make your recipes I will post my comments. Hi Mil, thanks so much, so glad you enjoyed the bread, and yes nothing like making yeast bread, once you start it’s hard to stop. Looking forward to hearing what you make next. 🙂 Have a great weekend. I’m Not a baker at all. My 12 year old had to find a recipe that included using yeast for a class. She wanted to bake something different than the other kids. Came upon your recipe. It took us some time! Followed the recipe to a T. We didn’t event taste it before she took it too school. I was worried that it was going to be hard since we baked it the night before. She used strawberry jam. At the end of the day her teacher came up to me and said that dessert was amazingly delicious! And asked for the recipe. Now my daughter will be baking this for the Family on Thanksgiving. Thank you! What kind of yeast did you use?? Hi Gaby, I use Active Dry yeast, not instant dry yeast. Hope that helps. Hi Melissa thanks, that is a great description. Hope you enjoy it. Let me know. Do you have any suggestions on how to simplify this recipe/make it less labor-intensive for someone struggling with low energy from chronic health issues? Hi Holly, unfortunately since it is a yeast bread there is more work involved. If you have a stand up mixer with a dough hook this will make it a lot easier for you. The machine will do all the kneading. Hope that helps, and sorry for your chronic health issues. Can’t wait to try this! Did you use all purpose flour? Thanks! I made them but a few werent fully seal, but it tasted really good! Hi Constanza, glad to hear you enjoyed it, sometimes if you don’t seal them really well, they come unsealed. Have a great week. These look unbelievably appealing to me. I was late to this type of bread (Called “monkey bread” in the states), but now I’m hooked. And with the delicious stuffings you suggest, I could eat the entire batch myself. 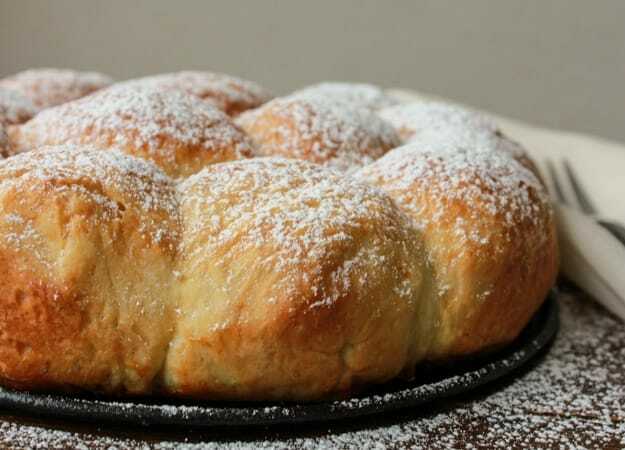 Hi Laura, Thanks, you and me both, I had never heard of monkey bread or pull apart bread until a short time ago. They are delicious aren’t they? Have a great weekend. Looks great, but i was wondering at what temperature are you supposed to bake them at? Hi Sandy, sorry about that, it should be baked at 320° (160° celsius) thanks.